We've watched other Buck Denver DVDs with mixed opinions, so I began watching this with a little bit of skepticism. It turned out to be a good little learning DVD. In fact, The Boy even came in to watch it with us and afterward commented that it was pretty good. One of the best things about the DVD is that it not only shares the Christmas story from Luke, but it also relates it to salvation. After watching the DVD, Sassy and I sat down to talk about it, and she accepted Jesus as her Savior. How exciting! Each of my girls learned new things about Christmas from the DVD. We don't "do" Santa Claus at our house, so I had never really taught them about the background story. The DVD showed the story of who St. Nicholas was and how Santa Claus was derived from him. They also learned where the word Christmas came from. Overall, this is a good DVD to help children understand how some of the "secular" Christmas traditions relate to Jesus' birth. You can learn more about Buck Denver Asks...Why Do We Call It Christmas at the website, watch the trailer on YouTube, like on Facebook, or follow on Twitter and Pinterest. 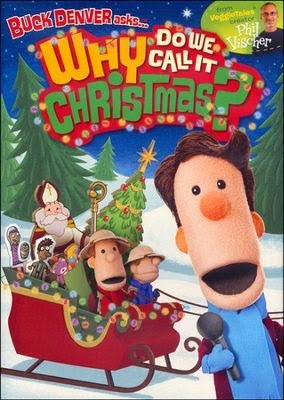 You can also enter for a chance to win your own DVD copy of Buck Denver Asks...Why Do We Call It Christmas.